I am actually writing this post on Thursday night because on Friday I am heading off to spend my Mother’s day weekend in the woods with a bunch of Girl Scouts. So if you think your Mother’s day is going poorly.. just remember mine: Cold, dirty and internet-less, surrounded by sleep deprived 8 years old who have played with fire and ingested a ton of sugar in the form of s’mores all weekend long. Ahh.. the joys of motherhood! Okay, enough joking. On a more serious note, today’s Flashback Friday post is about ways to show the moms in our lives (not necessarily our own moms since I know not everyone has a great relationship with their mother but moms in general) how much we appreciate them. Two years ago I wrote a post about my experience as a mother and my reflections on motherhood. Those sentiments still hold true today. There is no one way to characterize a "good mom" since every situation is unique. And most moms are doing their best, even if some days it feels like nothing is going right. The blue and brown items are baby socks, stacked and rolled, and wrapped in baby wash cloths (which are orange and white) There is also a little white onsie, folded into a square and placed under the little fish chew toy. All the “sushi” is wrapped in black grosgrain ribbon and tacked in place with a small pin from the back side. Inside the take out container are small bottles of baby shampoo and powder, wrapped in white tissue paper to look like rice. The only non-baby items are the chopsticks and the plate itself. 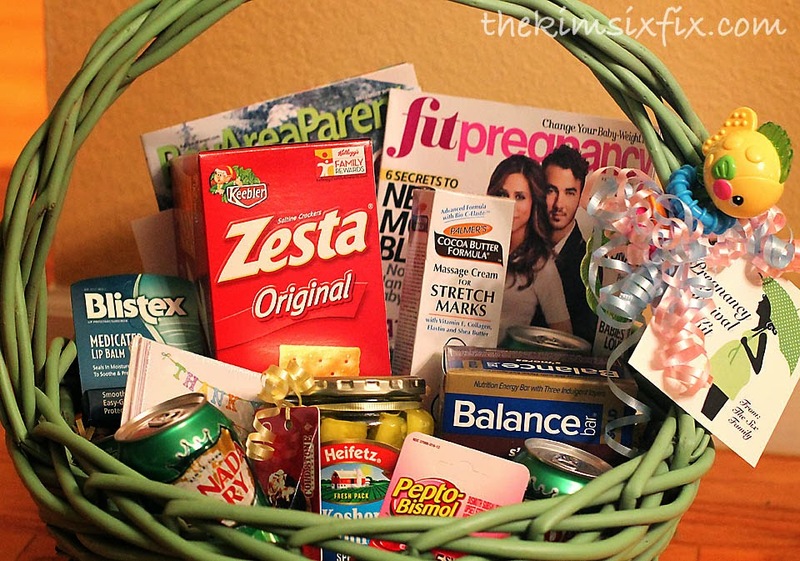 With all the essentials for a happy pregnancy (Pickles and Ice Cream, Ginger Ale, Crackers, Stretch Mark Lotion, Magazines and Chapstick..) any soon-to-be mom would feel pampered receiving this on Mother’s Day. 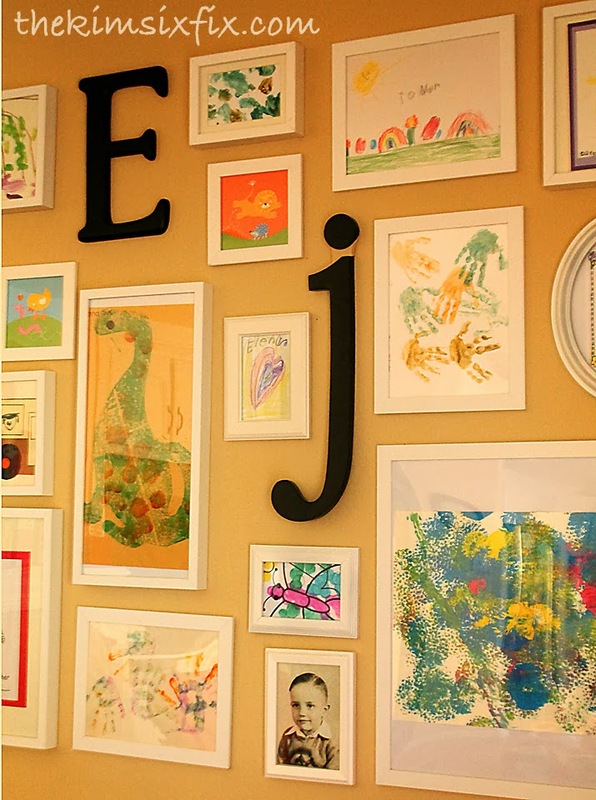 For the mom with kids beyond the baby stage, why not surprise her with a gallery of her kids’ artwork? There isn’t anything much more personal than crayon drawings and finger paintings. 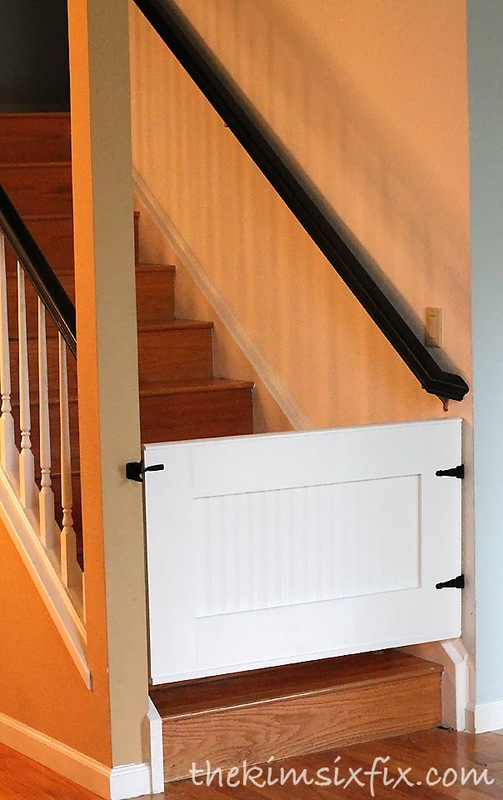 You don’t need to take up an entire wall, but matched frames on a stair landing or above her desk would be a great surprise. And finally, if you really are dealing with the mom who has everything, well then there is always the good old standby of sweet treats. 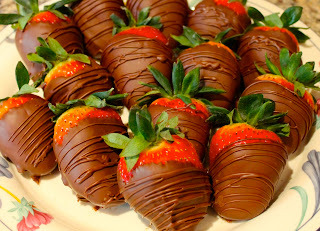 This is my cheapskate version of those expensive chocolate dipped strawberries. Seriously, you cannot lose with chocolate. Whatever you decide to give the mom, at least give her a hug and remind her that her Mother’s Day could always be spent without running water and electricity! That will make that last minute card from the drugstore look good!